Every year we ask what marketing activity will be in most important for our readers' businesses or clients. In our trends polls for the last 3-4 years content marketing has always been the top topic with 20% of the vote this year. 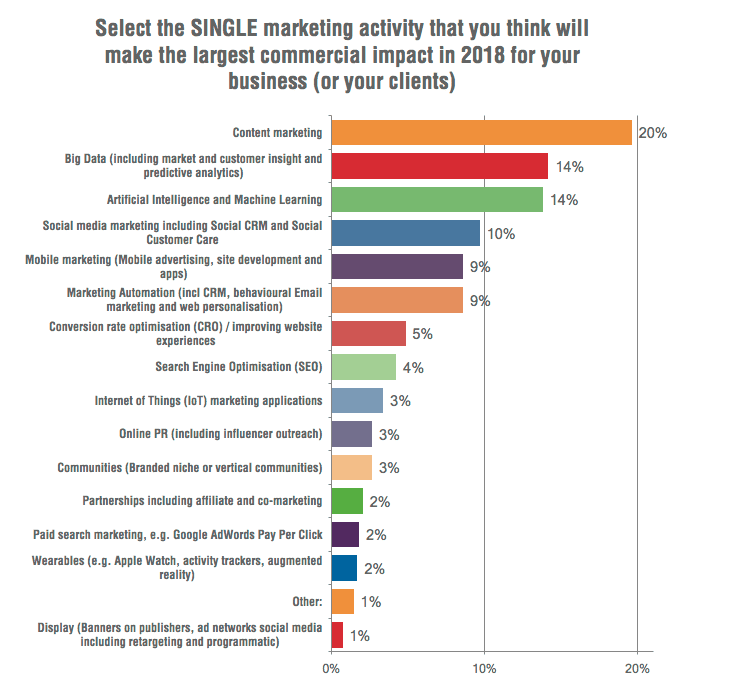 The annual report by the Content Marketing Institute (CMI) describes, for the eighth year, the implications of content marketing and how it can be utilized to provide better results and engagement. Content marketing is an important part of any business and fuels all forms of inbound techniques (email, social, paid and organic search). Having a clear and defined content marketing strategy will not only help you create content but audit and set goals, improve content distribution and help evaluate and measure ROI. Findings are based on a sample size of 117 respondents from for-profit organizations based in the UK (66% B2B, 9% B2C and 25% both B2B and B2C). 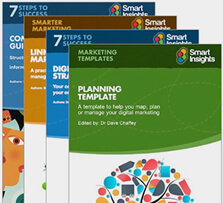 Our digital marketing statistics resources for our premium members are aimed at saving you time when you need the latest stats for a presentation or report you're working on against a deadline. The visuals of stats are carefully selected to help you make your case for investment in digital marketing to colleagues or clients. "A strategic marketing approach focused on creating and distributing valuable, relevant, and consistant content to attract and retain a clearly defined audience - and, ultimately, to drive profitable customer action." The 14% who replied that they did not use content marketing could be ecommerce sites that focus solely on AdWords for higher positions of landing pages on SERPs and do not create content about products with their industry. It is common that ecommerce stores don't have blogs and, in fact, focus more attention on sales copy, CRO and product conversions. The majority of businesses using content marketing techniques are small businesses or people marketing teams that serve the entire organization rather than multiple brands and product lines. 47% said they do not source any content marketing activities. The majority of respondents (52%) say that their content marketing approach is moderately successful. 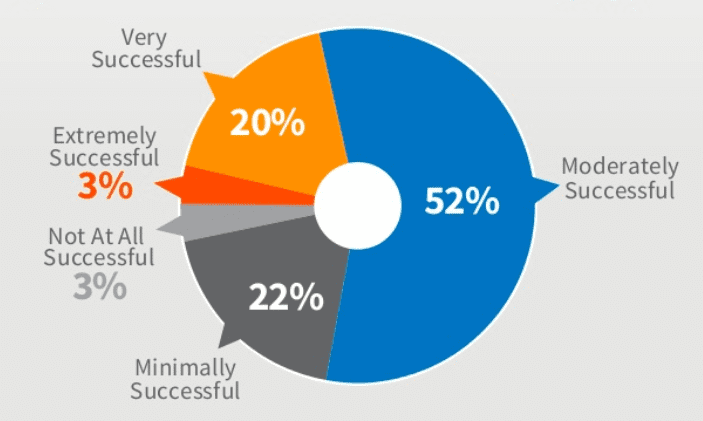 Only 20% say very successfully and only 3% extremely successful. This raises another question of what they benchmark as 'successful' - for some brand awareness is traffic through to the site and landing pages may be more 'successful' than conversions in some instances. Others may measure social metrics and engagement as successful as users are engaging and interacting with content. Choosing the right metrics to track is vital in measuring your content marketing effectiveness and success. 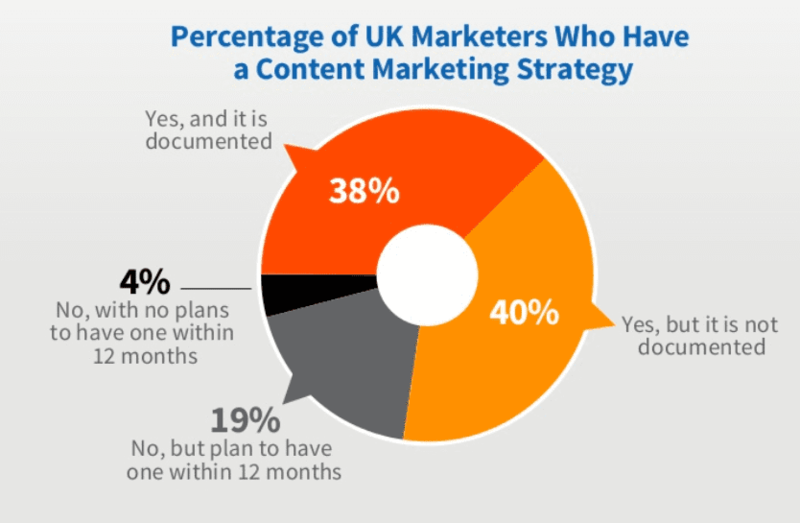 However, 54% of respondents say their content marketing approach is somewhat more successful compared to one year ago. Only 2% say it's somewhat less successful. Higher quality and more efficient content creation are believed to be a major factor contributing to UK marketers' increased success over the last year (83%). Content that engages the reader is likely to perform much higher - have you tried storytelling techniques to help with your content marketing? 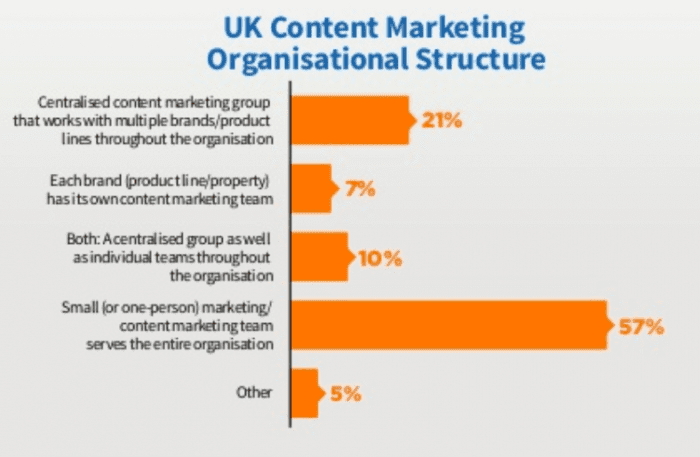 So what factors do contribute to content marketing success? Other responses included content marketing technologies/tools (24%), content marketing training/education, and changes in target audiences (13%). If you find your content marketing is reaching the desired results then you may be targeting the wrong audience or have the wrong tone and content for your target audience. "78% of respondents said their organization has a content marketing strategy (38% said it was documented and 40% said it was verbal only)." In the United States CMI research shows a similar pattern with 37% of businesses not having a defined content marketing strategy. Knowing what to include in your content is also vitally important. Without the right message or concepts, it'll be difficult to get your target audience engaged. But what concepts work better? 91% say that they always ensure content is fact-based and credible. This is important in crafting your reader's trust - the more helpful and trustworthy they position you against competitors the more likely they are to keep coming back to your site instead of others. Surprisingly, 21% say that they do not base content on specific points of the buyer's journey. 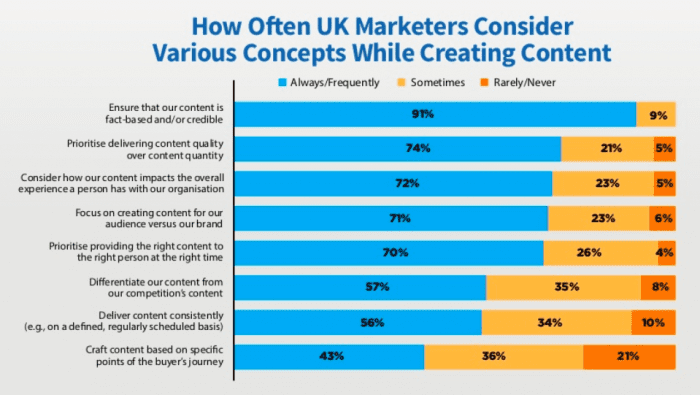 This could be the reason why 22% previously stated their content marketing approach is minimally successful. Not understanding your audience and potential buyers will lead to disengagement of brand, purpose, and meaning. If you aren't aware of different touch points in the buyer cycle then it's difficult to answer their questions and help at different pain points. 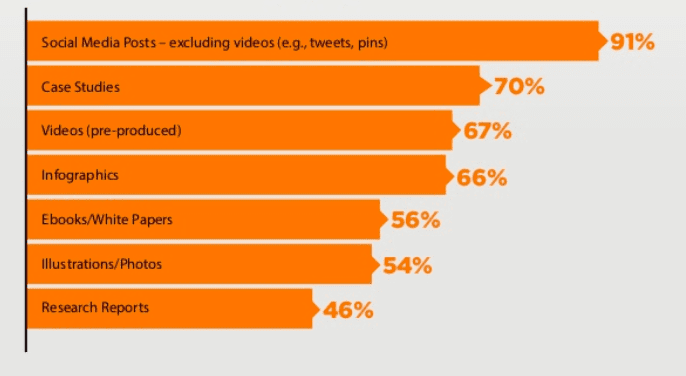 The most popular type of content is social media posts (91%) then case studies (70%). case studies demonstrate achievements and success stories of products and are a great social proof indicator of the quality of your product/service. On average, businesses use 5 different types of content. Twitter is the most popular social media platform marketers use for content distribution (95%) yet LinkedIn is the most effective (73%). For more, check out their slide share for the full report. With every company keen to climb Google’s search rankings, it is easy to lose perspective by simply churning out fresh content that seizes on the zeitgeist or otherwise meets current demand It is difficult to overstate the importance of evergreen …..